Measuring 4.4 x 3.1 inches, the P50 is an I/O expansion board designed for and driven by TERN’s 586-Engine™. 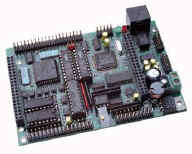 The parallel ADC and DAC on the P50 can only be used by boards, such as the 586-Engine, with a 16-bit external data bus. Many embedded applications need high speed ADC and DAC with buffered operational amplifiers supporting variable gains or offset for analog signals. With this in mind, the P50 supports four channels of 12-bit, 300KHz, parallel DACs (DAC7625, 2.5V). These four channels are buffered by 4 on-board ops with a hardware adjustable gain; this is configured for a gain of 2 by default, giving an output range of 0-5V. A resistor pot is used to adjust the DAC analog output offset. The P50 also supports eight channels of 12-bit 300 KHz parallel ADC (ADS7852, 0-5V). Four of these input channels are buffered by ops. A precision voltage reference (LT1019) with built-in temperature sensor can also be installed. The 586-Engine provides 32 PIO digital I/O pins on the J2 header; these range from 0-3.3V. The P50 can be used to buffer these PIOs with 16 sourcing drivers (UDN2982), or 14 sinking drivers (ULN2003). Using these drivers, the PIO pins can source or sink 350 mA at 50V per line to directly drive solenoids, relays, or lights. Seven of these high voltage drivers can be re-configured as high voltage inputs. Eight high isolation voltage photocouplers (PS2701, NEC) can also be installed to provide optically isolators to these PIO chanels. Two quadrature decoders, (HCTL2020, Hewlett Packard) can be installed to interface incremental motion encoders. In addition, 24 bi-directional TTL-level I/O pins provided by an on-board PPI (82C55) are software programmable, and available for your application. An Ethernet LAN controller (CS8900) can be installed to provide network connectivity. A RJ45 8-pin connector is used to connect to a 10-baseT Ethernet network. A software stack library is available, supporting network protocols like ARP, DHCP, UDP, ICMP, and of course TCP over the Ethernet network. Two channels of RS-232 drivers and a 5V linear regulator are on-board. An optional RS232 or RS485 driver can be installed for the 3rd UART of the 586-Engine. The P50 requires 8.5V to 12V DC power supply with linear regulator, or can support up to 30V DC power input with an optional switching regulator without generating excessive heat. 586-Engines are best suited to take advantage of the features of the P50. But other 16-bit Engine controllers, such as the i386-Engine and A-Engine86, can be installed on the P50 as well; these controllers are limited in that not all of the propre PIO pins are available. Only 8 high voltage drivers and 5 opto-couplers are available for the A-Engine86. Only 9 high voltage drivers and 8 opto-couplers are available for the i386-Engine. The P50 is also very similar to the P100 and P300, other expansion boards intended for TERN engine controllers that provide a wide range of new I/O accessibility. Copyright @2012 – TERN, Inc.
24 additional I/O lines from PPI. 8 opto-couplers, 2 quadrature decoders.